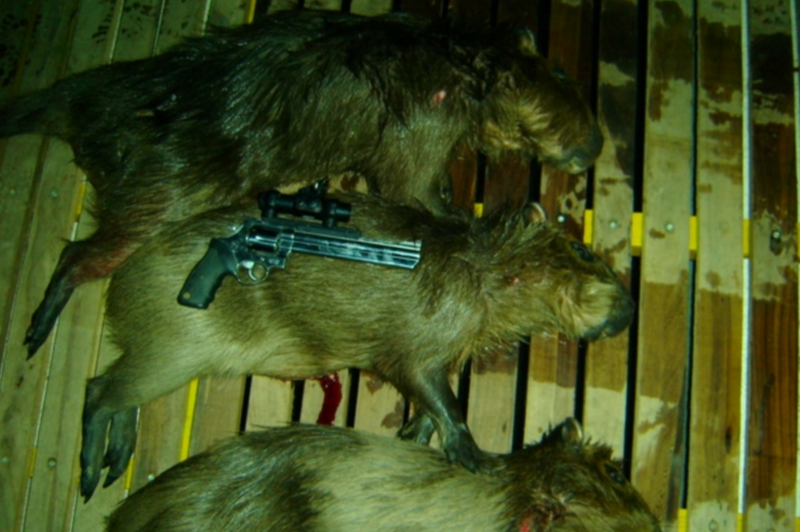 Capybara Slaughtered For Gloves, Hunted for Fun: IARFB Investigates. Endemic to South America the Capybara that is classed as a rodent is the largest rodent of its kind on the face of the planet. Furthermore due to its craved after soft hide the Argentinian and Peruvian government back in the 1960’s regulated the trade of Capybara from which the worlds largest rodent is now nothing more than a fashion accessory. 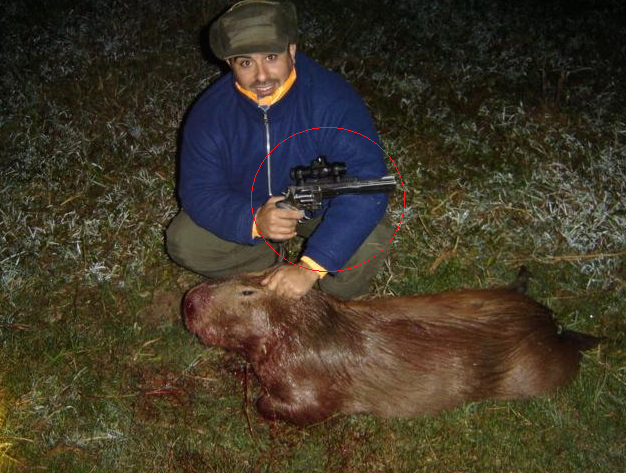 International Animal Rescue Foundation Brazil have been undertaking investigations on Argentinian Capybara farms where they have located some of the most unpleasant abusive regimes. Filthy and repulsive grounds that the worlds largest rodent is being farmed on, and slaughter men secretly filmed by the team playing football with one of the young from which it later died an agonizing death. Please be aware that the team could not intervene as that would have compromised the entire investigation thus leading to them being arrested for trespassing, and subsequently removed from the country back to Brazil. The videos are so traumatic and emotionally distressing we’ve passed them onto the Police and are now making some of our preliminary findings in brief aware to the general public. Furthermore we please advise all members of the public to please boycott all ‘Argentinian Capybara leather products’. These products will have a stamp on the inside or outside that typically will depict the traditional stamp with ‘Argentinian made and farmed Capybara leather’ imprinted on the product. International Animal Rescue Foundation Brazil (IARFB) have in the past three months embarked on a mission to promote awareness of our South American native Capybara, and to bring the current illegal black market leather industry that is pushing the species into extinction to a halt. This is not going to be easy though, and we need your help. Many people often associate leather with cows, smaller ungulates, snakes, crocodiles and other soft/hard skinned animals of which their skins are collected as a bi-product throughout the agricultural and farming trade worldwide. Fortunately while many of the animals listed above will probably never go extinct within the regulated farming industry that supplies leather products internationally and locally. The Capybara are seriously threatened by the ongoing leather trade, that is sought after throughout South America, primarily throughout Argentina. Capybara’s are farmed legally for their hides, and hunted legally and illegally for their exquisite leather hide that’s currently being shipped overseas to large well known international renowned clothing, and fashion industries within America, Canada, United Kingdom, Asia and Europe. Many leather companies that produce Capybara leather will try and tell you that its currently illegal to kill the species in the wild. In reality there is no such law that we are aware of, nor has it ever been listed on the International Union for the Conservation of Nature, which we are members of. However at times if one is caught poaching enforcement teams will seek an arrest and conviction, this is rare though. Within the leather industry the Capybara is commonly known as the ‘Carpincho’ which means water pig and is the largest rodent in the world. One only has to Goggle search “Carpincho leather” to see just how large this trade is. Furthermore black market trade was uncovered by our major investigations unit of which not a single piece of Carpincho leather was stamped and was being sold at a knock down price, which in turn will see more and more people move to the illegal traders rather than the regulated trade. This in turn will see our ‘wild specimens completely obliterated, equaling extinction’. While the species is not as yet considered endangered, the sheer fact that most Argentinians own at least some form of Capybara leather, and crave it yearly (especially for Christmas gifts). Its quite likely the species is going to plundered into extinction very soon. Argentaina is one of few countries that we know of that “regulates the trade of Capybara leather”, meaning the species are removed from the wild cruelly, bred then killed to provide anything from gloves, slippers, wallets, coats, belts Etc. 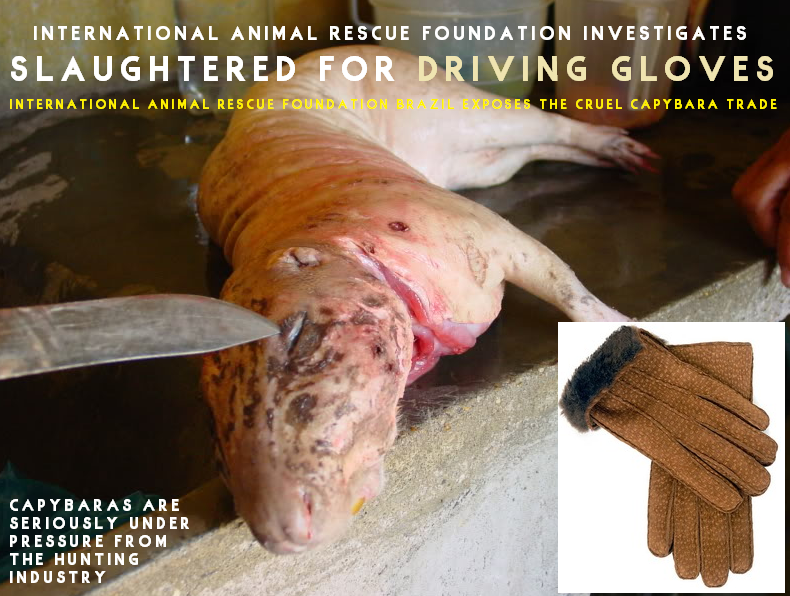 One of the most sought after Capybara leather products is that of driving gloves that are manufactured mainly within Argentina then sold by companies worldwide. Prices can range from anything to $50.00 to $400 a pair. The soft leather product is craved after due to its ability to make driving easy via allowing the steering wheel of the car to glide easily between the gloves and drivers hands. Argentina makes no effort to hide their filthy trade either of which they insist each product must be stamped as farm raised. 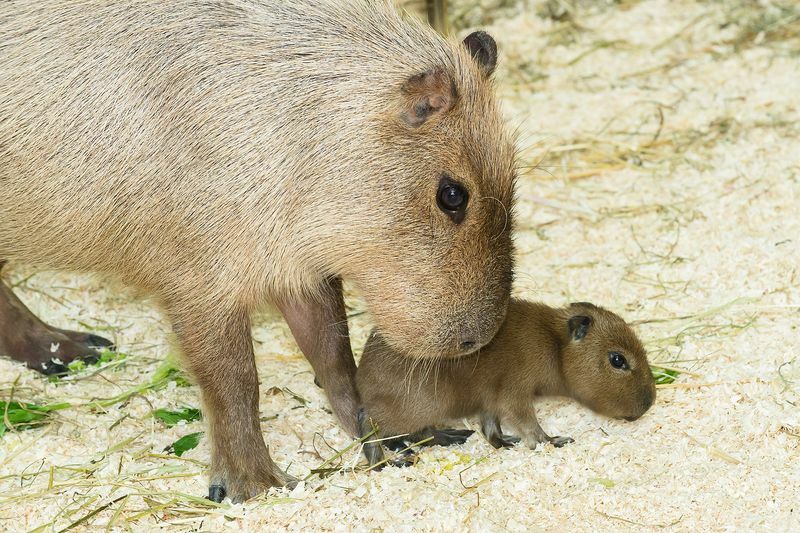 Its alleged that Argentina is the only manufacturing exporter in the world of Capybara products. Unfortunately International Animal Rescue Foundation Brazil has located a sickening black market trade throughout South America spanning into Viet Nam, China, Laos, Cambodia and Malaysia. Concerning; when we (IARFAB) visited Northern Europe we located countless high street shops that are selling Capybara products too that seem oblivious to the fact that the illegal wildlife trade decreases profit in the “regulated trade” which in turn is placing the species on the verge of nearing extinction within their endemic wild. Some of the companies located online can be seen below. 3. Lundorf Christiano that’s supported by Amazon offers yet another range of “genuine Capybara leather gloves”. 4. Alibaba that we’ve exposed countless times for allowing traders to peddle rhino horn parts and ivory, are also promoting the sales of Capybara leather. 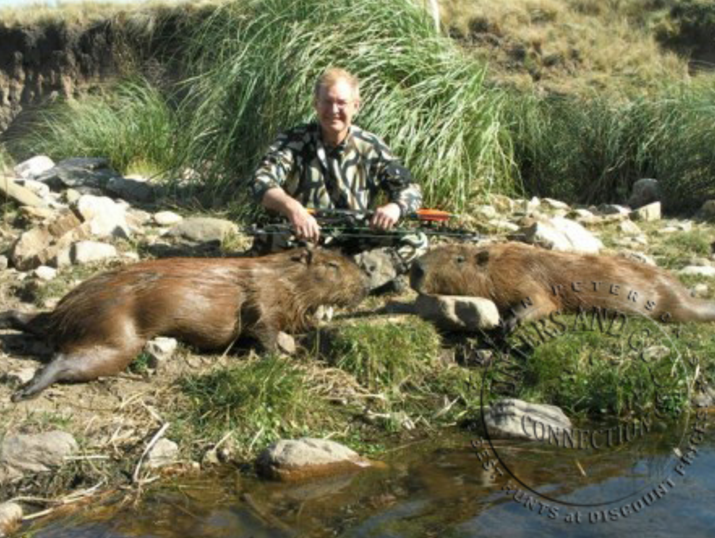 As explained above many companies within Argentina will try and palm people off that are purchasing Capybara products that hunting is ‘strictly illegal’ and the animals are protected under Argentinian law. 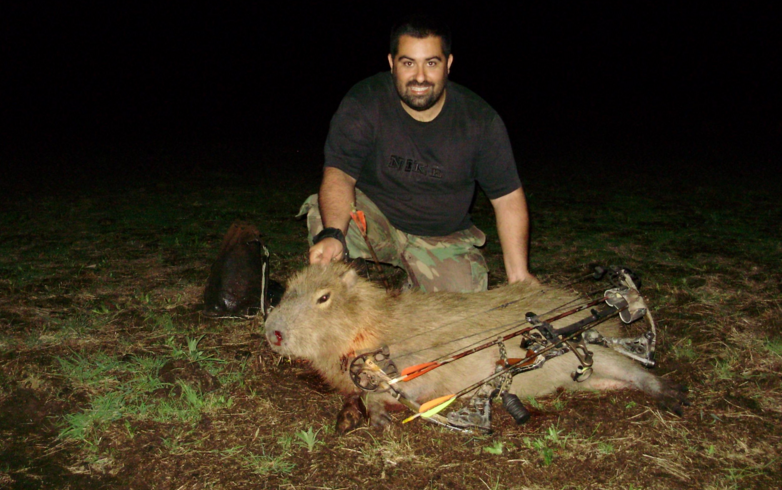 That’s not necessarily true and, we’ve located countless South American hunting outfitters that hunters from around the globe visit to hunt legally the Capybara species. See image below. The International Union for the Conservation of Nature has stated that the greater Capybara is listed as (least concern) and the lesser Capybara is (data deficient). So whats the big deal then? The IUCN has listed the lesser Capybara as data deficient as they currently do not know how many are remaining within the wild. So while hunting, poaching and the clothing industry takes its share. Research could prove within a few years that the lesser Capybara is in fact seriously threatened. So as one can see, unless action is taken sooner rather than later to remove one or most of these threats its very likely that we’re going to lose the worlds largest semi-aquatic rodent due to one of the above destructive actions. International Animal Rescue Foundation Brazil that undertakes animal and environmental investigations throughout South America; Stated “should we lose both the lesser and greater Capybara within the ‘wild’. The knock on effect this would have to our already threatened and fragmented ecosystem would be large”. Capybaras’ are herbivores that consume mainly grasses, aquatic plants, fruits and bark. Should both the larger and greater Capybara go extinct, plant-life would be affected. Herbivores consume plants that contain seeds, these seeds pass through the digestive system of the animals as they are moving around the forest floor, which are then deposited via feces, thus equaling spread of plant-life. One less herbivore means less movement and spreading of plants that are required for other animals to consume, and medicinal plants that humans require for natural medicines. The same applies to fruit too, not forgetting aquatic plants that need to spread throughout local rivers and streams that fish and small wildlife rely on to conceal themselves within from predators. Alien plants that the Capybara feeds on would also take over the forest floor thus pushing native non-alien plants into extinction. Extinction of both genera of the Capybara would therefore be catastrophic. International Animal Rescue Foundation Brazil are currently working to increase awareness of the Capybara and will be undertaking demonstrations outside of trading stores that trade in Capybara leather products. You can help International Animal Rescue Foundation Brazil with its current investigations by sending any small or large donation. Simply click here https://www.paypal.com/uk/webapps/mpp/send-money-online add our email that is here: info@international-animalrescue-foundation.org.uk then your kind donation, then simply hit send. The Capyabara pictured below is not protected as many have been led to believe. Furthermore if the clothing and fashion industry as well as the hunting industry is not regulated accordingly we’ll lose the entire species within ten years. The (IARFB) are working on fact sheets for local schools, universities and will be running classes to increase awareness and education about the species of which your help is required. For more information please email the team above.